Self-doubt is a painfully common experience for a business owner. From hitting “publish” on a post to developing a new product to holding your hundredth discovery call, even C-level executives have been quoted expressing a continued struggle with feeling like a fraud. The struggle is so real that all the way back in the late-70’s researchers Pauline Clance and Suzanne Imes gave it a name –> Impostor Phenomenon. It is now estimated that around 70% of people will experience impostor phenomenon at least once. As a business owner, there’s good reason to feel like a fraud. As you seek to grow and you step into roles you never imagined for yourself, personal growth becomes mandatory. On a near-daily basis (depending on where you are in your business) you are operating at the edges of your capabilities — an intensely vulnerable place to be. Unfortunately, without an effective response to self-doubt, you can find yourself losing motivation, drooping in creativity, and spending a lot of time on stuff that doesn’t really help your business. Because doubting yourself is so common and so problematic, this post is all about how to see your self-doubt in a new light. And because I want you to effectively step into your business and keep pushing the edges of your comfort zone, I’ve made a cheat sheet for you to keep on hand for when self-doubt strikes. We’re in this together, ok? Pin that image for later, friend! Or click here to pin directly from Pinterest! Clance and Imes describe impostor phenomenon as a feeling of “phoniness in people who believe that they are not intelligent, capable or creative despite evidence of high achievement.” What they saw happening in the women they were studying was that despite great capability and high motivation for achievement, they lived in fear of being “found out.” Sound familiar? Yea, me too. Self-doubt is stressful. It’s extremely difficult to focus on a task when your brain is telling you that you 1. have no right to be doing it and 2. you’re going to be found out. That is a threat to your security and you are biologically wired to avoid that kind of threat. Your body’s stress response is designed to go nuts at this point to give you the energy you need to get to safety. But we’re not in the savannah running off on our own from the rest of the tribe and therefore at risk of getting mauled. A new business adventure may not sound all that revolutionary but for your brain, it’s different than what is status quo. And therefore a threat. Your brain chemicals are quickly transitioning to a stress response in order to prime you for action – to run from the proverbial lion. When you’re publishing new, high-value content, developing a new product, or consulting with a new client, your brain is looking at the possible outcome and responding based on prior experiences (imprints – like that time you were called a know-it-all in middle school). It then goes into automatic survival mode. A droop in chemicals like serotonin and oxytocin give you that feeling of fear and loneliness while cortisol spikes your heart rate. In essence, your brain perceives a need for a safe place amongst safe people and your biochemistry is responding appropriately to get you moving in that direction. BONUS! 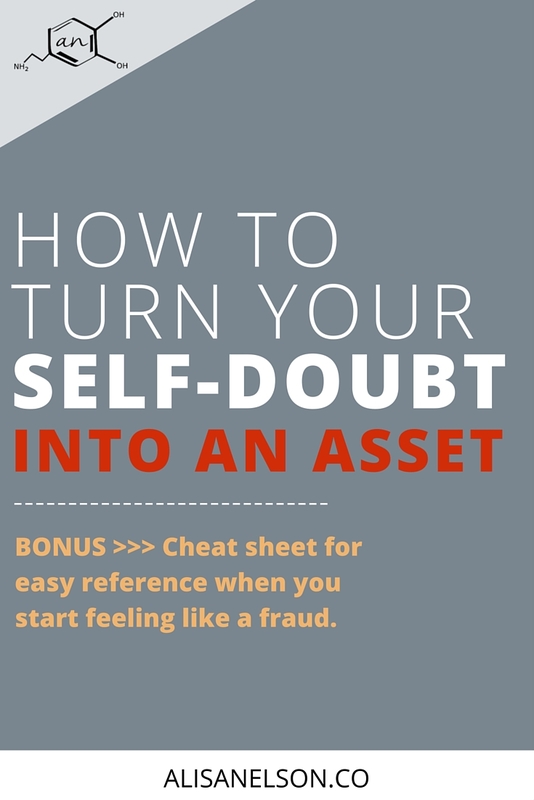 Click here now for your free cheat sheet to help you take first steps when self-doubt strikes. Now let’s talk about why you should not move in that direction and what you should do instead. So we’ve talked about what happens in your brain when you try something new, but what about behavior? That’s the stuff we can actually look at in our everyday lives. So what happens when someone is experiencing self-doubt? Blindly listen to the shame gremlins.If you abandon every idea, project, or opportunity that you don’t feel 100% capable of doing (from meeting new people to launching a new product), you’re life will be spent watching everything Netflix has to offer. You’ll be constantly seeking to numb yourself to avoid shame and the deep longing to do something important with your time. But you are strong, brave, and clever. So don’t just walk away, ok? Cover over the gremlins with inspirational quotes.There is inspiration that points us back to truth and grounds us in a bigger purpose beyond our own comfort, and there’s “inspiration” that is completely devoid of meaning and like putting a child-sized bandaid on a gunshot wound. Words like “you got this!” are pointless if they don’t point to concrete evidence.Trying to deceive yourself into doing the work will more likely serve to reinforce the feeling of self-doubt, and possibly even make it true. What happens if you just ignore self-doubt? Suppressing internal messages will lead to increased internal pressure. Increased pressure can lead to explosions. Many people talk about the cycle of depression, anxiety, greater loss of self-confidence, frustration, and loss of interest they experience while attempting to build a business. It’s burnout. When you fail to respond to what your body is telling you, your body makes you respond by first shutting down your ability to focus and be productive, followed by real health issues like insomnia, headaches, depression, anxiety, etc. Mindfully approach your self-doubt, seeking to understand why it is there and to learn more about yourself through the process. Mindfulness is a neutral look at your thoughts, feelings, and environment. You’re an observer of what’s going on, gathering information, and taking appropriate actions. “Welcome, old friend”Pema Chondron talks about smiling at fear and welcoming it. You should expect it to be there – you’re being creative and gutsy. You can’t expect to just shoo it away or that you will grow out of it – instead you can let it be a sign that you are daring to do something new and let it sit while you ask more questions. You can say to yourself, “I must be pushing the edges of my comfort zone.” That’s good. As a creative entrepreneur, that’s what you want. Your brain is giving you space to do a gut checkLet’s remember that it is entirely possible that you are an impostor (gasp!). People claim to be more capable than they are all the time. Sometimes it’s with malicious intent and other times it’s simply because they lost perspective.For example: Maybe all the people you follow on Twitter have been blogging about a certain topic – like landing pages – and you decide to do the same. Except that it is a little out of nowhere compared to the rest of your blog content. That feeling you have that makes writing the post hard or makes you feel a little extra self-conscious? That’s a good thing. You’re getting a chance to decide if that’s a direction you want and should take your business or if you got a little bit of copycat syndrome and need to scrap the idea. Our minds get hijacked all the time by the things we see making other people happy. Acknowledge you got distracted and just move on. Your brain could also be telling you that you don’t have enough information. Strangely enough, you could be endlessly surfing web pages because you do indeed need more information. But it’s not likely that reading 20 versions of the same post is going to get you what you need. If you’re developing a course for other graphic designers and you realize your understanding is a little shallow in an area, you need to problem solve, not consume more blogs. Assess your current capabilities and that which is required for the task or project at hand. If you need more information for your course on design, don’t just binge-read Elle & Co blog posts (it’s fun, I know! And I’m not even a designer! ), reach out to Lauren and talk shop. That way you can get a better feel for another designer’s process and swap sources. Seek effective support. More than just an instagram post or a “you got this! #girlboss.” Go to one of your favorite Facebook groups and ask a question. Get on the phone with someone and talk about what’s going on. Work with a coach who will encourage you + help you see the path. Take note of your common indicators for self-doubt. What are your specific triggers? What does the downward spiral tend to look like? Never stop learning. You will always have space to grow. You set yourself up for failure when you start to believe you’ve got this girlboss thing figured out. So surround yourself with people who push you to perform at a higher level and make a habit of seriously learning. This is more than scanning blog posts that catch your eye. I’m talking keep a list of problems you keep running into and actually seek to understand the issue. Some things you’ll get to delegate – bless your soul for not needing to know everything yourself. But some things (like understanding “how do people learn best” for that course you’re outlining) are vital to the efficacy of your work. I’m a scientist at heart. The specific behaviors I’ve indicated here are not exhaustive and I’m always gathering more in order to help people (including myself) understand why they do what they do. I also love supportive evidence. So tell me in the comments – what do you start doing when you’re doubting yourself? What helps you move through it? I love this. I’ve been very guilty of letting doubt get the best of me. Working on it and this is a great reminder. Glad it could serve as that reminder, Becky! It’s always a practice…a work in progress, yea? Thanks for stopping by! What a well-written post! I think this is a great reminder of the choice we have to make to avoid letting fear/doubt dictate what we do! Thanks for sharing!! Thank you, Kristina! Totally agree – sometimes the action will even *look* the same but when it’s done by choice instead of by fear it becomes an engaged decision. Thanks for your feedback! Glad it was helpful, Meaghan! Thanks for stopping by! Yes. Small moves. Glad you have been able to talk to yourself like that, Melissa. It’s huge to be able to notice our behavior and take action to get back on the path you want to be on. Wow such a powerful post! I have been full of self-doubt for like a week now and you perfectly described everything I am feeling and doing! I can’t tell you how many times I have found myself on Facebook or checking my email and procrastinating on everything else! After reading this, I was able to sit down and determine what my self doubt triggers are! This makes me so happy, Emily! Did you get the cheat sheet? The library also has a workbook for creating a specific-to-you action plan for approaching self doubt in the moment. If you’ve identified some triggers that would be a great next step for you! And let me know if you have any questions or if you keep struggling this week – I’d love to walk through it with you. No selling or spam, just a deep desire to help you succeed. Oh boy, I have self doubt all the time! Hmm…my first reaction is to shut down and get pitiful. I start to obsess over my social media likes, etc. and berate myself for all the stuff I didn’t do that other people are doing. Once I arrive at that lovely place, I have to force myself to take a deep breath, turn off my phone, and find inspiration through learning. Usually, when I learn something new, I feel a lot better about myself, and it usually inspires me for the next blog post or project. If I just keep myself open to absorb instead of beating myself up, I feel better and produce better work. Great post, thank you so much for this! You have no idea how much this lifts up so many of us struggling creatives! I love that – motivation through learning. I have a theory that it reminds us we are capable of growth, which is my, hands-down, most effective reminder for getting through an experience that feels too hard. Thanks for your feedback, Carole. I’m so very happy to see how well this post has been taken and inspired myself – it’s my greatest joy to empower others to keep going after their potential. Have a wonderful weekend!